Gazing upwards at a Harvest Moon is a visual treat that lights up the sky once a year, typically in September. But since the luminescent rock floating above us doesn't beam its orange-tinted glow down to Earth at exactly the same time every year, stargazers will be pleased to know that this year's Harvest Moon is taking place on Thursday, October 5. 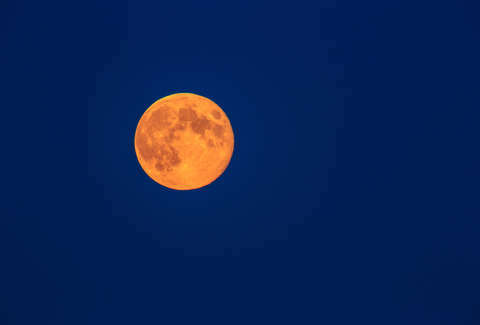 It's likely that the term Harvest Moon rings more bells for you as a pop-cultural trope, due to the abundance of Neil Young references and its longstanding lore in poetry and art. The term stems from the country's agrarian roots, however, and references the time of year when farmers would harness the moon's radiant glow to help harvest their crops when electricity wasn't a viable option. Harvest Moons occur during the full moon closest to the autumnal equinox, or in more everyday parlance, the first day of fall. Last year, the event took place with a sublime coincidence, as it occurred in tandem with a penumbral lunar eclipse that shrouded a decent swath of the Earth in premature darkness. While that particularly rare event won't happen again until 2024, Thursday's October Harvest Moon is a little less rare because it occurs every three years. So do make sure to be aware of the sky when the sun sets tomorrow evening. The moon should have a more-orange-than-usual glow about it, which is something you won't see during this specific month again until 2020. You won't need binoculars either. Just come armed with curiosity and a little enthusiasm for the onset of fall.